Properties FormTablet Weight72 (gms) Dimensions4.5 (cm) x 4.5 (cm) x 8.2 (cm) About Diabecom DS(Double Strength) Tablet Diabecon DS is a double strength phytopharmaceutical formulation for the effective management of type II diabetes. Combats diabetes: The natural ingredients in Diabecon increase insulin secretion in the body. By reducing the glycated hemoglobin level (form of hemoglobin used to measure glucose content in the blood) level, normalizing microalbuminuria (a condition which is an important prognostic marker for kidney disease in diabetes mellitus) and modulating the lipid profile, Diabecon minimizes long-term diabetic complications. The drug also increases hepatic and muscle glycogen content, which enhances the peripheral utilization of glucose. Anti-hyperglycemic: Diabecon reduces high glucose content in the blood. Effective hyperglycemic control is important in preventing micro- and macrovascular complications (large and small blood vessels) arising from diabetes. Indications: Non-insulin-dependent diabetes mellitus (NIDDM/type II), as a monotherapy or as an adjuvant to other oral anti-diabetic drugs For NIDDM with signs and symptoms of hyperlipidemia For NIDDM with early retinopathy For NIDDM with microalbuminuria As an adjuvant in insulin-dependent diabetes mellitus (IDDM/type I) Key ingredients: Gymnema’s (Meshashringi): principal constituent is gymnemic acid, which has antidiabetic properties. It reduces excessive blood sugar. It also has a regenerative effect on pancreatic beta cells and is insulinotropic, which means that it stimulates the production and activity of insulin. Gymnema temporarily abolishes the taste for sugar and helps decrease sugar cravings. It increases the activity of enzymes responsible for glucose absorption and utilization. Indian Kino Tree’s (Pitasara): principal constituent, epicatechin, has alpha-glucosidase inhibitory properties and regularizes key metabolic enzymes involved in carbohydrate metabolism. 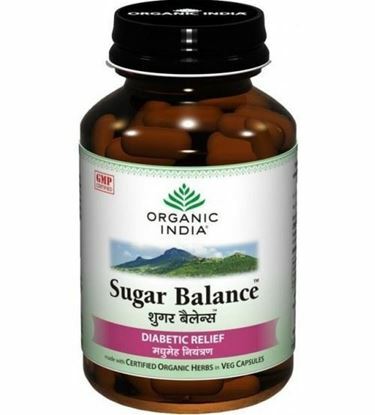 Shilajeet: decreases hepatic glucose production and prevents hyperglycemia. Shilajeet has a protective action on b-cells of the pancreas, and promotes unrestricted endogenous insulin action. 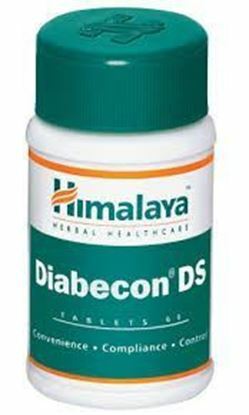 Side effects: Diabecon DS is not known to have any side effects. Terms and Conditions We have assumed that you have consulted a physician before purchasing this medicine and are not self medicating. Properties FormTablet Weight56 (gms) Dimensions5.4 (cm) x 4.3 (cm) x 8.4 (cm) About Karela Tablet Karela Tablet is a medicine that is used for the treatment of Diabetes, Gastrointestinal Upset, Ulcers, Colitis, Constipation, Intestinal Worms and other conditions.Karela Tablet contains Momordica Charantia as an active ingredient.Karela Tablet works by possessing the antidiabetic and hyperlipidemic effect; possessing tretament of diabetes as adjuvant with other other allopathic drugs. Karela Tablet - Composition and Active Ingredients Karela Tablet is composed of the following active ingredients (salts) Momordica Charantia Karela Tablet Uses Karela Tablet is used for the treatment, control, prevention, & improvement of the following diseases, conditions and symptoms: Diabetes Gastrointestinal Upset Ulcers Colitis Constipation Intestinal Worms Karela Tablet Working, Mechanism of Action and Pharmacology Karela Tablet improves the patient's condition by performing the following functions: Possessing the antidiabetic and hyperlipidemic effect; possessing tretament of diabetes as adjuvant with other other allopathic drugs. 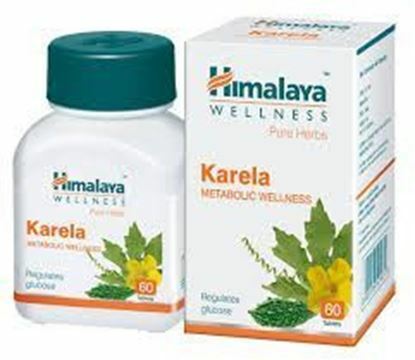 Karela Tablet - Side-effects The following is a list of possible side-effects that may occur from all constituting ingredients of Karela Tablet. This is not a comprehensive list. These side-effects are possible, but do not always occur. Some of the side-effects may be rare but serious. Consult your doctor if you observe any of the following side-effects, especially if they do not go away. Irregular Heart Rhythm Abdominal Pain Diarrhea Headache Karela Tablet - Precautions & How to Use Before using this drug, inform your doctor about your current list of medications, over the counter products (e.g. vitamins, herbal supplements, etc. ), allergies, pre-existing diseases, and current health conditions (e.g. pregnancy, upcoming surgery, etc.). Some health conditions may make you more susceptible to the side-effects of the drug. Take as directed by your doctor or follow the direction printed on the product insert. Dosage is based on your condition. Tell your doctor if your condition persists or worsens. Important counseling points are listed below. 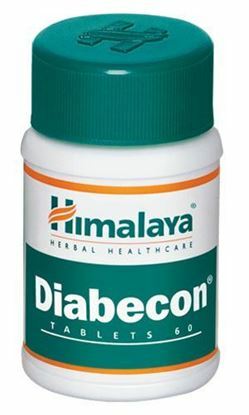 Diabetes Dosage/Directions for use: Tablet: 1-2 tablets twice daily. Special instructions: Please inform your physician before consuming in the following situations: Pregnancy Breastfeeding Diabetes Hypertension Contraindications: Specific contraindications have not been identified. Terms and Conditions We have assumed that you have consulted a physician before purchasing this medicine and are not self medicating. Properties FormDrops Weight69 (gms) Dimensions3 (cm) x 3 (cm) x 9 (cm) Indications of Dr. Reckeweg R40 Diabetes, pernicious anaemia and phases of degeneration centred in the blood and glandular system, such as leucemia, anaemia, Iymphogranulomatosis, but specially diabetes. R40 lessens the secondary symptoms like: depression, agitation, flatulent sensations, lack of appetite, aggravation when the weather changes, thirst, itching etc. 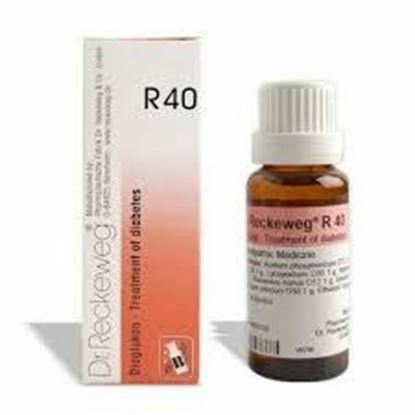 Mode of Action of Main Ingredients in Dr. ReckewegR40 In the insulin dependant diabetic a carefully measured reduction of the insulin units is possible after long continued administration of R40. Acidum phosphoricum: Thirst, sexual impotence, psychic depression. Arsenicum album: Unquenchable thirst, progressive exhaustion. Lycopodium: Remedy of the liver, flatulence, swelling sensation. Natrium sulfuricum: Remedy of the liver, specific action in case of aggravation in damp weather. Phaseolus nanus: Sugar in urine, irregular cardiac action. Secale cornutum: Thirst, prickles and paresthesia, longing for cold. Uranium nitricum: Specific in diabetes of varying genesis Dosage of Dr. Reckeweg R40 As prolonged cure, 3 times daily 10-15 drops in a little water before meals. After some improvement reduce the dose to twice daily. Terms and Conditions We have assumed that you have consulted a physician before purchasing this medicine and are not self medicating. Properties FormCapsule Ideal ForMale, Female Weight126 (gms) Dimensions4.8 (cm) x 4.8 (cm) x 9.2 (cm) Terms and Conditions We have assumed that you have consulted a physician before purchasing this medicine and are not self medicating. 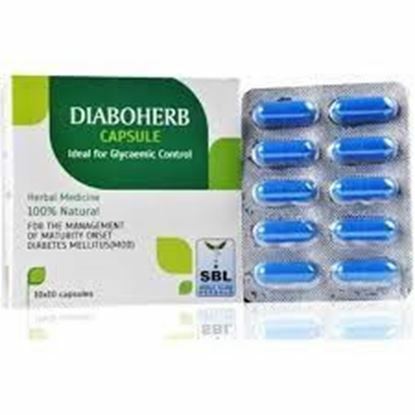 Properties FormCapsule Weight100 (gms) Dimensions8.5 (cm) x 6 (cm) x 8.5 (cm) Indications of Diaboherb: Increased Blood sugar levels.